Stephen Chernin/Getty ImagesFinancier Bernard Madoff arrives at Manhattan Federal court in March 2009 for a sentencing hearing. U.S. regulators plan to fault JPMorgan Chase, which served as Bernie Madoff's main bank for two decades, for failing to conduct adequate due diligence and report suspicious activity, according to a person familiar with the matter. The Office of the Comptroller of the Currency is expected to issue a cease-and-desist order against JPMorgan, which will require the largest U.S. bank to put an end to the alleged failures in its anti-money laundering practices. The timing of the order is uncertain but could come later this year, the source said. A fine isn't expected. If the OCC isn't satisfied with JPMorgan's response, it can take harsher action against the bank, including financial penalties. OCC spokesman Bryan Hubbard declined comment, as did JPMorgan spokeswoman Jennifer Zuccarelli. 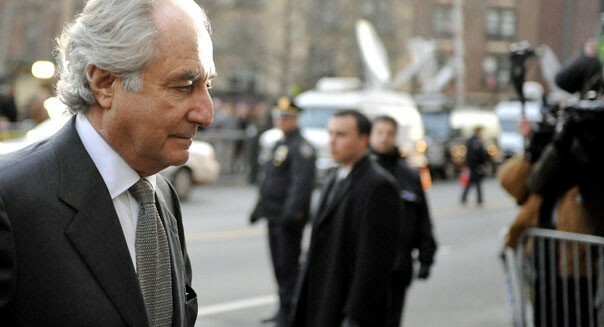 Madoff was arrested in December 2008, pleaded guilty in 2009 to running a massive, decades-long Ponzi scheme, and is serving a 150-year prison sentence. Irving Picard, a trustee for Madoff's victims, has accused JPMorgan Chase & Co. (JPM) of ignoring warning signs that Madoff's business was a fraud and has attempted to sue the bank. A judge has tossed out all but $425 million of Picard's $19.9 billion lawsuit against JPMorgan. Picard is in the process of appealing the ruling. JPMorgan has said there was no evidence showing that anyone at the bank knew of Madoff's elaborate scheme. The bank did file a suspicious activity report in London two months before Madoff was arrested, describing his investment performance as "too good to be true," according to Picard's lawsuit. The OCC will fault JPMorgan for treating Madoff and his related entities as low-risk customers, and find that the bank failed to heed red flags, such as funds being shuffled between accounts without clear business purpose, said the person familiar with the matter. As a result, "suspicious" transactions weren't reported to authorities, said the source, who wasn't authorized to speak publicly about the matter. The OCC in January ordered JPMorgan to tighten its risk controls and improve its anti-money laundering compliance. But the regulator separated that order from any action related to Madoff's accounts, in a dispute with the bank over which documents it had to turn over as part of the inquiry. The inspector general of the Treasury Department, which houses the OCC, has since ordered JPMorgan to work with regulators in the Madoff inquiry and rejected the bank's argument that certain documents were protected by attorney-client privilege. "The matter is still pending," said Richard Delmar, counsel to the Treasury's watchdog office. JPMorgan has a recent history of tense relations with the OCC. A report released last month by a Senate investigative panel revealed frequent clashes between the regulator and the bank over its $6 billion "London Whale" trading losses. In a letter to shareholders last Thursday, JPMorgan CEO Jamie Dimon said he expected more regulatory action against the bank in the coming months. "We received regulatory orders requiring improved performance in multiple areas, including mortgage foreclosures, anti-money laundering procedures and others. Unfortunately, we expect we will have more of these in the coming months," Dimon said. "We need to and will do all the work necessary to complete the needed improvements identified by our regulators," he said. U.S. authorities have stepped up efforts to police illicit money flows, and have ordered banks such as Citigroup (C) and Germany's HSH Nordbank to improve their controls. In December, HSBC agreed to pay a record $1.9 billion in civil and criminal fines, largely to resolve charges that it failed to detect money from drug trafficking which was flowing from Mexico into the United States. And in one of the first bank mergers to be publicly impacted by money-laundering concerns, M&T Bank Corp. (MTB) on Friday said its proposed purchase of Hudson City Bancorp Inc. (HCBK) will probably take more time to close because the U.S. Federal Reserve had identified concerns with M&T's anti-money laundering systems. Sharing a name with one of the most notorious corporate scandals in history is a heavy cross for a sports venue to bear, so it's little wonder that the Houston Astros sought a new sponsor for their home, Enron Field, as soon as they could. Enron had purchased the naming rights in April 2000, but declared bankruptcy in December 2001. The Astros bought their naming rights back (cheap) and by June 2002, had inked a more fruitful deal that renamed the stadium Minute Maid Park. While watching minor league baseball may lack some of the excitement of a major league game, it's still a lot more fun than getting a tooth filled. One has to wonder, then, if Manchester New Hampshire thought twice before selling naming rights to a company that brings the dentist's chair to mind. With its brick walls and huge "Save-On-Foods" signs, Victoria, British Columbia's sports venue looks like a supermarket on steroids. Still, the center is home to two hockey teams and regularly hosts concerts by major artists. If there isn't a rule about putting an exclamation point in the middle of a sports coliseum's name, there should be. For the time being, however, Louisville's $238 million, 22,000-seat arena bears a name that brings to mind chicken fingers, rather than the University of Louisville's basketball teams, which play there. While it sounds like a relic from the 1970s, Amway is still going strong, and its eponymous Orlando sports venue is slick, glassy and ultramodern. For NBA fans, the stale direct-marketing connotations of the name above the door pale beside the power of the Magic they can see playing inside. Beyond its surfeit of syllables, Overstock.com Coliseum's connection to the discount online retailer has a low-rent feel that seems out of place next to its high-rent teams -- including the Oakland Raiders and the Oakland A's. Little wonder, then, that it's been rebranded as the O.Co Coliseum. Even under the best of circumstances, it's not easy being home to New York City's second most beloved baseball team. To add insult to injury, Citi Field, which opened in the height of the Great Recession, was named for one of the nation's more notorious banks. A few months after it opened, the stadium found itself back in the headlines for reasons other than sports when Bernie Madoff's trustee sold the disgraced money man's season tickets to the park. Unfortunately for both the Mets and their sponsor, these days, New Yorkers sometimes refer to the stadium with a more profane monicker that rhymes with "Citi." To begin with, there's the problem with the names themselves: "3Com" hardly rolls off the tongue, and "Monster Park" sounds like a place where one goes to watch huge trucks run over each other. To make things worse, though, there's the fact that the people of San Francisco chose the name "Candlestick" in a name-the-park contest that was conducted when the stadium opened. Little wonder, then, that they eventually voted to return to the original name to the park. In 2005, Corpus Christi, Texas got one of the more bizarrely-named minor league baseball stadiums when Whataburger, a Texas-based fast food chain, paid an undisclosed amount for naming rights to its field. Home of the Corpus Christi Hooks, Whataburger Field will retain its odd name until at least 2020, when the naming contract will expire.